This is specially designed to provide (free) air flow and a see through security screen thus giving protection against vermin and debris. This door is commonly used on underground car parking entries and where airflow and security is required e.g. security entrances, bottle shops, boiler rooms, sub-stations, mall entries etc. The vision-air roller shutter will be manufactured by 3rd Generation Doors. The curtain will be constructed using 75mm, 100mm or 130mm by 1.0mm thick galvanised steel roll formed interlocking slats. 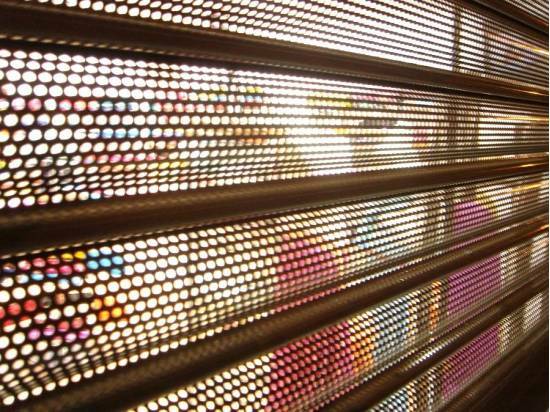 The slats will be fully perforated with 2mm perforations to the entire slat face. Alternative slats will be fitted with nylon end clips. The door will be operated by chain or electric motor where specified. The curtain will be pre paint finished to colour specified. The curtain will be constructed using 75mm, 100mm or 130mm by 1.0mm thick galvanised roll formed interlocking slats. The slats will be fully perforated using 2mm perforations. Each alternative slat will be fitted with nylon end clips to prevent lateral movement. Guide channels will be manufactured from roll formed galvanised steel channel section having a depth of either 65mm or 75mm and matched to suit doorway..
Will be either by means of a hand chain through a suitable gear reduction for ease of operation or motorised using a three phased reduction geared motor incorporating limit switches and emergency hand chain operation in case of power failure. Centre mullions can be provided for multiple installations normally of a sliding type to suit applications where required. Doors up to 6 metres in height and 7 metres in width. All heavy doors are recommended to be motorised. 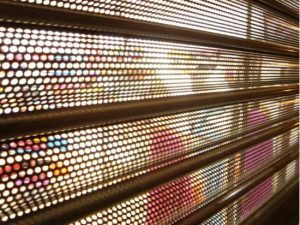 We recommend that ail shutter curtains be painted either by using the powder coating process or using polyurethane paint. Guide channels galvanised and all other components to be given a priming coat of zinc rich grey primer. The drum will be a steel cylindrical tube encasing helical torsion springs matched to suit door weight and size and revolving on a steel axle. The support brackets will be fabricated from mild steel plate having a minimum thickness of 6mm and matched to the door weight and size with provision made for fixing to brickwork or steelwork.